I discovered Lara Williamson thanks to the wonderful praise of her by my twitter friend Jo. When I looked into Lara Williamson’s books a bit more I discovered she had a reputation for delivering ‘heart felt’ family stories, which I have discovered this year is one kind of children’s story I love to read. I used ‘heart felt’ to describe a story where the main character or characters go on an emotional journey through the story and where they learn something about themselves and others and what is important to them. It takes talent to tell this kind of story well and Lara Williamson has plenty of it. What is great about this story is it is also really funny. A book with a superhero on the front would not have normally been my first choice of read. I chose this particular story of Lara Williamson’s as it was @kidlitreaders book of the month. The superhero on the front will encourage some children to pick this book up. For some it may also introduce them to a story which is different from what they have read before, and it’s always great when that happens. I tested out some book covers for 8 to 14 years fiction on my daughter (who is nearly 9) I showed her a sheet with 30 book covers and asked her to pick on the basis of the cover which books she would most like to read. She chose 6, one of which was ‘Just Call me Spaghetti Hoop Boy’. Yet this is the same child that has never been the slightest bit interested in superhero’s! So I think the Usbourne books have done very well with the cover design to make it appealing to a variety of children. The story is about a boy called Adam who was adopted as a baby and is living happily with his family until one day they are asked to do a family tree project at school and he starts to wonder what his birth mum is like, and realised he wants to know who she is. As the story starts to unfold he is also worried about his adopted (‘real’ mum) because she keeps crying and he doesn’t know why. Then Adam thinks that if only he can become a Superhero everything will be alright his ‘real’ mum will stop being sad and his birth mum will be proud of him (if he can find her first). Lara Williamson cleverly manages to put you inside Adam’s head, so you can understand why he acts as he does. My favourite character is Tiny Eric, a Polish boy in Adam’s class, and his best friend. I loved how Eric tried to get Adam to believe by drawing a picture of a four leaf clover. Eric has his own family problems, but these were only hinted at, because you only got to meet him when he was with Adam. For the readers to see Tiny Eric mainly from Adam’s perspective is a very clever idea. “ Because Mum tells me he likes to make people happy. I loved how when towards the end everything in Adam’s life hit crisis point, ‘sausage roll’ comes to the rescue, and then helps the reader to understand the journey that Adam has been on. 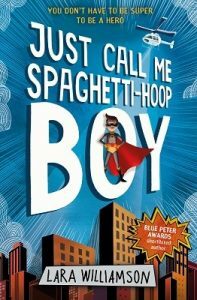 Just Call me Spaghetti Hoop Boy is a heartwarming story of personal discovery, friendship, family and discovering what ‘being home’ truly means. I would highly recommend for reading alone from age 9 years and above. It could also make a great read aloud for slightly younger children. Next Post Next Post: Making connections: the importance of live author events in keeping that spark alive and in ‘opening doors’.